On 16th December 2013, the day after Tottenham’s humiliating home defeat by Liverpool, Andre Villas-Boas was relieved of his managerial duties at White Hart Line. A poor return of just 27 league points in 16 games combined with a lack of goals was enough for Daniel Levy to issue AVB with his P45. On the day AVB was sent packing Tim Sherwood assumed first team coaching duties, and it was with some surprise that one week later he was handed an 18 month contract as the permanent Spurs Head Coach. Ten league games later, Sherwood’s Spurs have racked up 23 league points. His average of 2.3 points per game comfortably betters AVB’s return of 1.7 points per game and so this means that Levy made the correct choice in disposing of AVB’s services. Right? The performances of Spurs under AVB and Sherwood show how management in the modern game is so difficult. The desire to obtain results in the short term means that some very knee jerk decisions can, and are, being made. Sherwood has certainly put league points on the board for Tottenham, but based on their underlying numbers their performances under him don’t look any better than the previous performances under AVB. Lefty Gomez, a pitcher in Major League Baseball in the 1930s and 1940s, often remarked “I’d rather be lucky than good”, and at this stage it looks like Time Sherwood would share that sentiment. The Shot Chart excludes penalties and shows average shots per game. 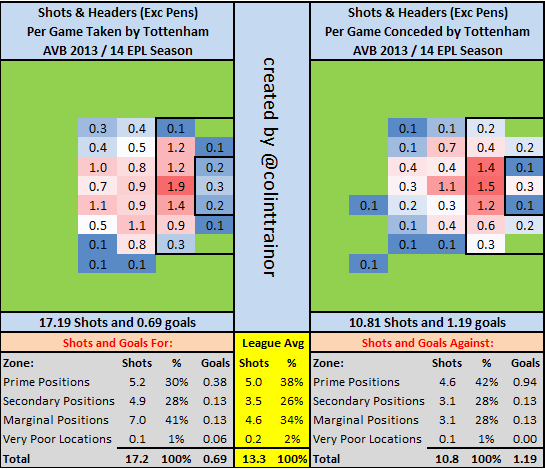 Shots taken by Tottenham under AVB’s reign are shown on the left side, with their shots conceded appearing on the right side of the image. All teams attack the goal on the right in my Shot Charts. The table below each chart shows the average number of shots per game across four different zones, where the chances of a shot being scored reduces as we move through the zones. The proportion of shots in each zone are shown, followed by the average number of goals per game in total and separately for each zone. 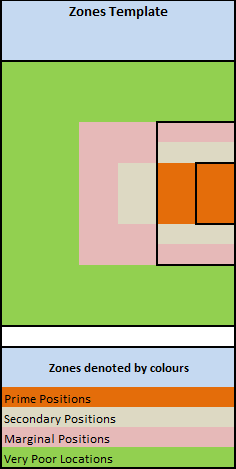 Anyone who wants to see the boundaries of the four zones that I refer to can scroll down to the bottom of this post where I have included a layout template. We can see that AVB’s Tottenham averaged more than 17 shots per game, but scored less than 0.7 goals per game (penalties and own goals are excluded here). On the other side of the ball, his team gave up almost 11 shots but managed to concede 1.2 goals per game. The yellow panel in the middle of the graphic shows the number of shots taken in each zone by the average Premier League team during AVB’s managerial spell. Although Tottenham had almost 4 more shots per game (17.2 versus 13.3) than the average team, we can see that the bulk of their additional shots came from zones other than Prime zone, with the result that these additional shots would have had a reduced probability of being scored. This fact that Spurs had more shots is no real surprise as I think most watchers of the game will have been aware that Tottenham shot a lot, but that a fair number of these were from low goal expectation locations. However, I don’t want to compare Tottenham’s attacking performance under Villas-Boas against the average Premier League team. Instead I want to compare their attacking performance against their defending one. Despite having slightly more Prime zone shots than they conceded, the North London side managed to concede almost 1 goal per game from this zone yet managed to score less than 0.4 goals per game themselves. Tottenham converted just 7% of their Prime zone shots during their first 16 games but somehow conceded a goal in 1 out of every 5 shots that the opposition took from this same zone. AVB’s critics would say that his principled tactic of using a very high defensive line resulted in Spurs not conceding many chances but those they did would come with a high goal expectation. We can see that the above image shows this is true, as 42% of shots Tottenham conceded during this time were from the Prime zone, compared to 30% of their own shots. However, even allowing for the fact that the average shot Tottenham conceded was more dangerous than other teams we can see from the above graphic that AVB was most unfortunate to somehow end up with an average goal difference (excluding penalties and own goals) of -0.50 per game. Levy changed things up on the 16th December with the installation of Tim Sherwood, but how have Tottenham performed (from a shooting perspective) since then? The initial reaction is that those shot numbers don’t look like they should have returned 23 points from 10 games, but that’s what has happened. On the defensive side, Spurs have conceded 1 more shot per game than they were before Christmas – and worryingly for them that additional shot is coming from the Prime zone. 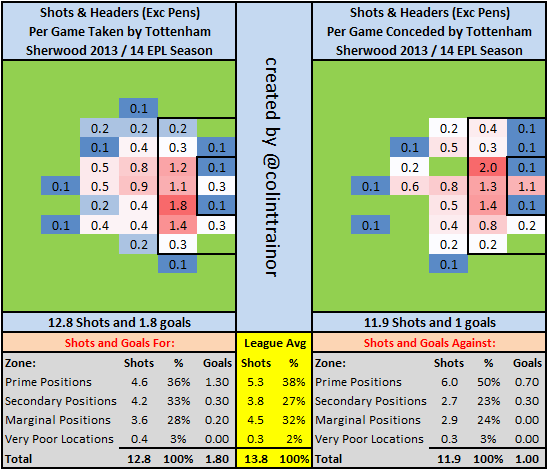 In fact, since Sherwood took over, half of all shots they have allowed have been struck from the Prime zone. Despite the notion that the AVB set up allowed good quality shots against them, it appears that the Sherwood version is even more susceptible to permitting very dangerous opposition shots. It’s worth specifically noting the concession of an average of 1.3 shots per game from within the 6 yard box is a particularly bad stat. Over the 10 games, this equates to 13 shots conceded from inside the 6 yard box and only Fulham and Cardiff have conceded more shots from this very important area in the period since Sherwood took over. By way of comparison, Everton have conceded 3, Liverpool 6 and Man City 4 over the same period, so the amount of such chances conceded by Tottenham are not consistent with a team chasing that important 4th league position. Yet, despite all of that, the concession of an average of just 1 goal per game (excluding penalties and own goals) is less than allowed by AVB managed Tottenham teams in the first half of this season. Although Sherwood’s Spurs’ have taken 4 shots per game less than AVB’s, the reduction in shots have mostly come from the low expectation zones – so there can be no great criticism of the quality and number of shots that Tottenham are now attempting. However, even with that allowance, Tottenham’s underlying offensive performance under Sherwood is similar to the defensive one described above. By this, I mean that the numbers don’t indicate that they should be any more potent than they were under Villas-Boas; but they have been. What has been different to the AVB reign is that over the last 10 games Tottenham have been able to put the ball into the net much more regularly than before. They have scored an average of 1.8 goals per game, which is more than a full goal higher than the AVB version of Tottenham managed to score. The difference in pre and post Christmas is encapsulated by the fact that under AVB, Tottenham scored just 7% of their Prime zone shots, this compares with a huge 28% conversion rate experience by Sherwood. Over the 10 games that Sherwood has been in charge, Spurs have an average goal difference (excluding penalties and own goals) of +0.8 per game compared to AVB’s -0.5. Yes, it is true that AVB’s goal difference took a hammering due to a couple of very heavy defeats but these can’t be ignored for two reasons. The first reason is that Sherwood has recently been handed his own Man City shaped spanking and secondly, those heavy defeats appear to have played a large part in the reason AVB was sacked. For example, had Liverpool beaten Tottenham by just a single goal in December would there have been the same clamour for his removal? We have seen that the swing in average goal difference of 1.3 goals per game hasn’t come about from an underlying difference in the number or quality of shots that their teams were taking and allowing. Instead, it looks like lady luck has played a huge factor in the goals tallies for both managers with Sherwood seemingly taking advantage of the “Luck Pendulum” as it came back Tottenham’s way just as he took over, with the North London outfit seemingly bereft of luck in the early part of the season. “You make your own luck” is a common cry, and whilst there is no doubt that Sherwood has been brave with his choice of tactics and personnel, the evidence of the shots that have occurred in Tottenham’s games would suggest that he has been fortunate in picking up as many points as he has. There is one metric that has perfectly captures the ebbs and flows mentioned above in relation to Tottenham’s season; PDO. As stated in James’ own definition, the weakness of PDO is that it treats all shots as equal. Fortunately in this instance, the profile of the shots taken and allowed is roughly similar in the two managerial spells so PDO will give us a good representation of what has been happening. The important figures are contained in the last column. Under AVB, Tottenham had a PDO of just 860, yet under Sherwood they have recorded an extremely large PDO of 1256. The league average team will record a PDO of 1000 and teams will tend to regress back towards that value. The AVB number of 860 in comparison to Sherwood’s 1256 neatly illustrates the difference in luck experienced by the two managers. We can see that the component that has seen the biggest shift in outcomes has been Tottenham’s Shooting percentage, ie Goals / Shots on Target. Under AVB, Tottenham scored from less than 17% of their shots on target, however since Lucky Tim has been at the helm they have managed to convert more than 51% of their on target shots!!! It may be the case that Sherwood has tremendous coaching capabilities but I’d certainly be betting that his Tottenham team won’t finish the season with more than half of their on target shots being scored. In fact, I’d wager that the Regression Monster is due to pay another visit to White Hart Lane. I have included both my Shot Charts and James’ PDO calculation in this analysis as they complement each other. The Shot Charts may help someone appreciate how such vastly different PDO scores can arise, and the one line PDO number neatly summarises the vast amount of information contained within the detailed Shot Charts. This piece hasn’t been written in an attempt to defend AVB or to suggest that Levy made the wrong move in sacking the Portuguese manager. Rather, the aim of this is to show just how fine the line is in such a results orientated business. The results achieved by Sherwood in the Premier League have been more impressive than those achieved by Villas-Boas, yet when we look beyond the bare league points won by each custodian there is nothing in the underlying numbers to suggest that Sherwood deserved to gain more league points than AVB. Sometimes football really is a funny old game. I can only hope that football club owners and chairmen have their own objective way to measure performances and that they don’t hire and fire solely with reference to league points won. For any that do use the latter criteria aren’t running their clubs in a way that will maximise the chances of their club being successful, however success is defined.